Happy New Year to you all! I’ve been looking forward to getting back into my normal routine of making and blogging, especially with my fractured elbow now fully healed up. I’ve got a tricky project on the go at the moment (much frogging and sad violin music) so here’s one I made earlier… This one made it off the hook just in time for Christmas! I went for one large butterfly – you can add as many as you like! 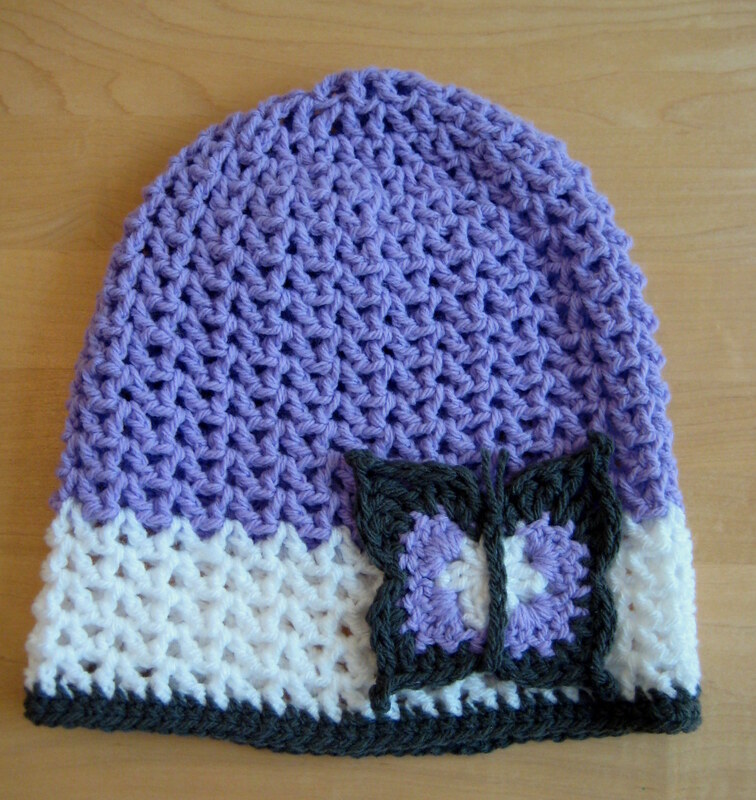 This hat is the matching item for my Butterfly Scarf pattern. It took me a couple of attempts as it first came out too big – I was aiming for a pre-teen size. The good news is that the 1st attempt works for a women’s size so now you all get both options! This cute hat would make a great springtime project. You can find the Butterfly Motif here. Trying to show you what it looks like by stretching it on to my adult sized head and taking the photos myself… Sorry, I was in a rush! I’m trying out downloadable pdf patterns! Scroll down to the bottom for a printable version and also this pattern written in UK terms. Please let me know what you think! You will also need a size 6mm hook. The pattern is worked in the round. After round 6, make sure you follow the right instructions for the size you want (pre-teen or adult size)! R1: 12dc into ring, sl-st to close (12 sts). Pull the ring closed. R3: ch2, ch1, dc in same st, *(dc, ch1, dc) in next dc, repeat from *10 more times, join with a sl-st (36 sts). [Adult size] R8 : sl-st into next ch sp. Ch2, ch1, dc in same ch-sp, *(dc, ch1, dc) in next ch-sp, repeat from * to end, join with a sl-st (84sts). [Pre-teen size] R7 : sl-st into next ch sp. Ch2, ch1, dc in same ch-sp, *(dc, ch1, dc) in next ch-sp, repeat from * to end, join with a sl-st (72sts). Both sizes: Repeat this last row until you wish to change colour – I did 7 more rows. R1: ch1 (counts as sc), 2sc in ch-sp, *2sc in next ch-sp, 3 sc in both of the next ch-sp two ch-sps, repeat from * around, join with a sl-st.
R2: ch1, sc in each st around. Repeat R2 until the band is your desired depth (2 more times approximately). Weave in all ends. 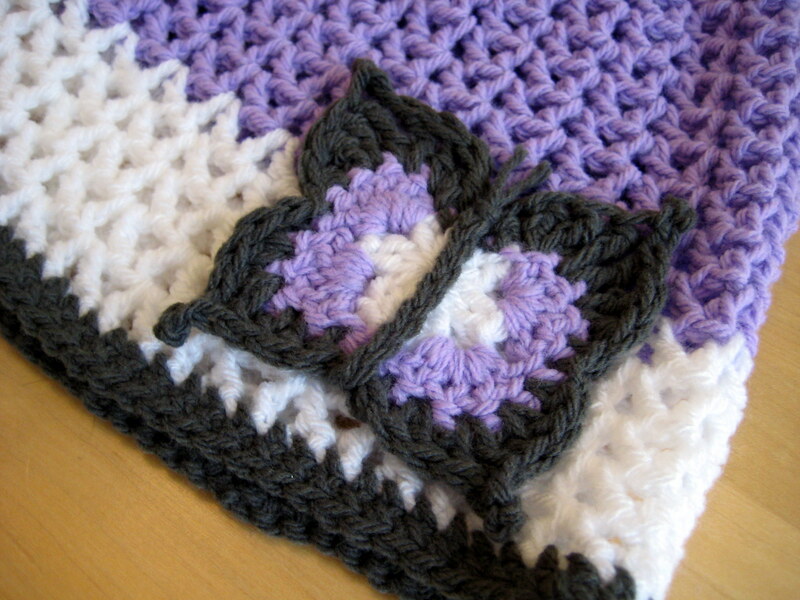 You can find the Butterfly Motif here – make as many as you prefer and sew on. Block as desired (I steam blocked this).